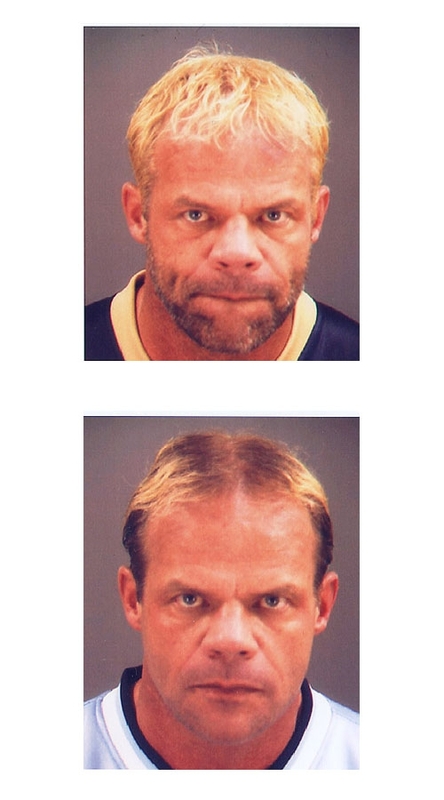 Wrestler Lex Luger (real name: Lawrence Pfohl) was arrested by Cobb County, Georgia cops in May 2003 after they found illegal bodybuilding drugs in his home while investigating the death of his live-in girlfriend Elizabeth Hulette (the wrestling personality known as Miss Elizabeth). The drug bust was the second time in two weeks that Pfohl was nabbed by cops. He was arrested in April and charged with misdemeanor battery for allegedly striking Hulette during a domestic dispute. The second mug shot is from that arrest. Submitted by tomtkh on Wed, 2010-12-01 14:25.